320 factory presets designed by Aiyn Zahev, eXode, and Navi Retlav Studio provide you quick access to a wide variety of sounds, like EDM plucks, lush pads, and aggressive bass. 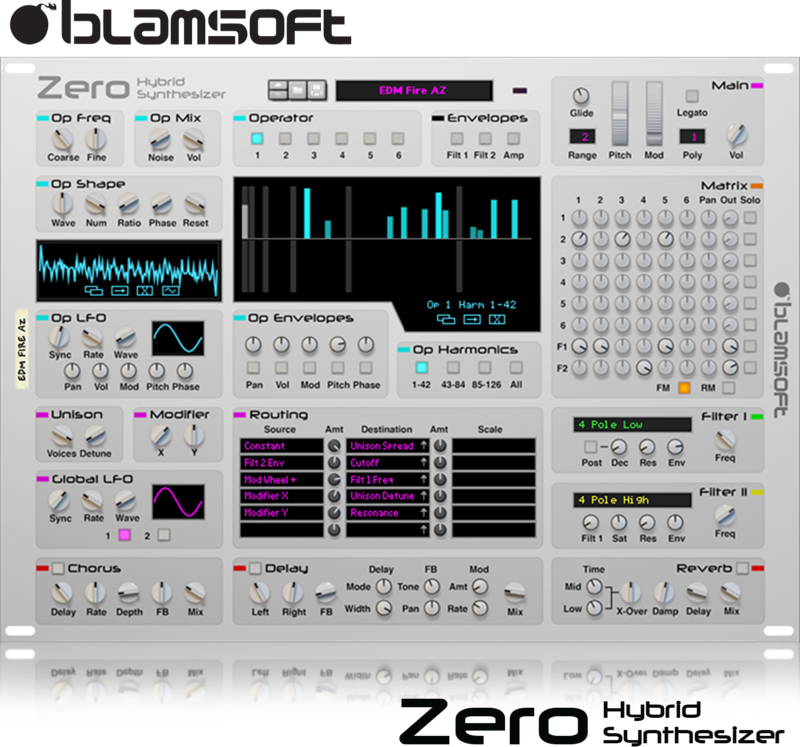 Zero’s operators have powerful additive synthesis engines with virtually endless possibilities. Start with a variable sine/triangle/saw/pulse waveform and duplicate it at any of 126 harmonic frequencies with adjustable magnitude and phase. Tweak the final output by setting the number of harmonics and spacing between harmonics. The operator waveforms are generated using up to 1024 sine oscillators for superb quality. Unison of up to 4 voices is provided. Frequency Modulation (FM) and Ring Modulation (RM) can be controlled by adjusting knobs in the matrix section. The ability to use FM and RM with the many unique waveform possibilities of the operators is one of the main reasons why Zero stands out in the Rack Extension crowd. Zero offers two multi-mode filters, each with 16 modes. Each operator can be individually mixed into the filter inputs and the filters can be routed in series. The latest Zero Delay Feedback technology was incorporated into the filters for a state of the art design. Zero has very flexible envelopes, and plenty of them. Click and drag editing takes place in the graphical display so you can easily see the envelope shape. Each envelope can have up to six stages, with either free or tempo synced times. And the envelopes can be looped for powerful modulation possibilities. 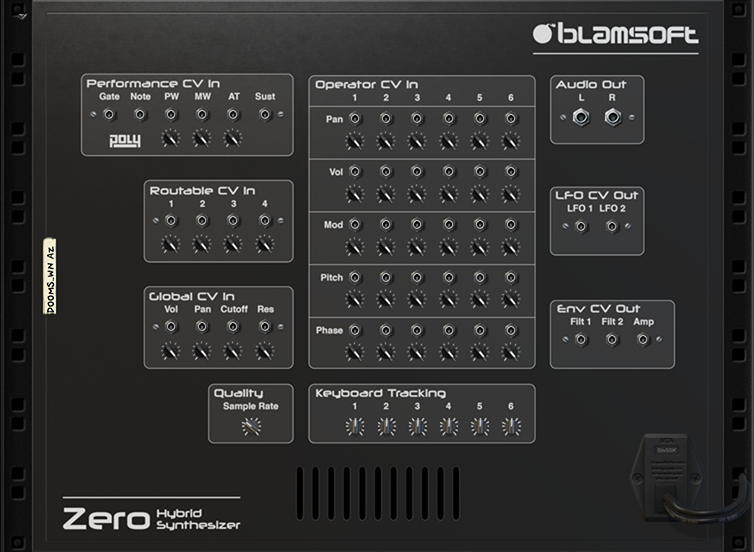 Each operator has a dedicated LFO, plus two global LFOs are available. A mod matrix provides routing to over 150 destinations. The last stage in the signal path is the built-in effects. The Roland® Dimension D style chorus nicely thickens up a sound. The Delay offers many tweakable parameters beyond the basics. And the reverb is a high quality Feedback Delay Network algorithm. The effect parameters can be modulated, nice for things like delay or reverb ducking. Zero has numerous CV ins and outs for external control and modulation. The Zero Song Challenge, hosted by Noel G. at ReasonTalk.com, resulted in some amazing songs that use Zero for all synth sounds. Thanks to everyone who participated and congratulations to the winners!